Can I CONVERT Properties on a form already created from Options to Check Box? Can I CONVERT a form's Properties FROM Options to CHECK box, without re-typing it all under Check Box? It is not possible to switch from radio button to checkbox, however, there is an easy way to create a new checkbox with the same options. 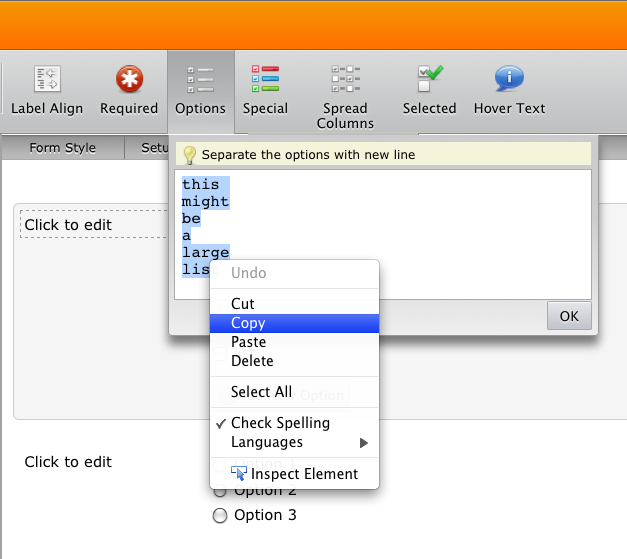 Click on the Options button on the toolbar and copy the list from the textarea. Then you can paste it to the textarea for the checkbox options.